There is nothing like skiing in the alpine resorts of Europe. It 's not so much the snow, which can be as finicky as anything found in New England, or the weather. But when the sun shines, as it did during a trip to the French resorts of Morzine and La Plagne last March, the international mountain top panoramas, combined with the crepes, and the wine -- this is France after all! -- make for an unforgettable ski and travel experience. France was our chosen destination because my travel companion, my 10 year old daughter Eve, is a student at Montgomery County 's French Immersion Program. Under these circumstances, a vacation in France is almost like being in school. We selected Morzine for a couple of reasons. It is only two hours distant [50 miles] from Geneva, which enjoys direct, non-stop flights from Dulles on Swissair. We also wanted to ski at a small French village, There is nothing small, however, about the skiing at Morzine. Morzine is part of the Portes du Soleil, a 420 mile network of 290 trails and slopes served by 228 ski lifts -- all accessible with one ski pass -- traversing twelve villages along the French-Swiss frontier. ​In an expanse so grand it is possible to find enough skiing for skiers at all levels. Ski brochures offer newcomers a list of ski circuits and estimates of ski times -- an invaluable guide for those heading off without benefit of instructors or ski guides. Morzine will host World Cup races this year. And it boasts a well -attended ski school for children from the age of four. There is no shortage of either ski touring or just simple mountain walks. 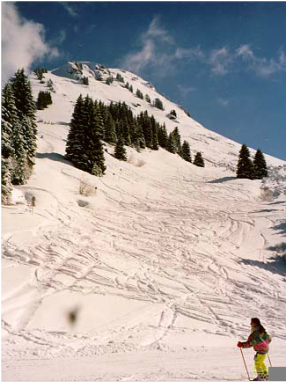 Snowboarders have a dedicated slope at Avoriaz. Morzine, despite its World Cup honors, rarely sees skiers from the US, who are most often attracted to the better known Megeve and Val D 'Isere. This is unfortunate because Americans will find much to like in this town and neighboring villages. ﻿As part of the Soleil network, it is possible to ski from Morzine for miles, traversing the border separating France and Switzerland. The sheer number of lifts -- primarily chair and poma lifts -- assures that you will rarely wait in a lift line once you're up into the mountain complex. The gigantic size of the ski terrain is a blessing. We skied for three days and rarely crossed the same trail or slope twice. But skiers should also be warned. If you don't exercise some caution and plan well, it can be a very long haul to your hotel or pension at the end of an extended day. No matter where you ski at US resorts, home is never too far away. At Morzine, a sudden snow storm, or a impromptu decision to quit after lunch can find you struggling to make it home from another country! We spent most of our days skiing the Pleney-Nyon-Les Gets region, which tops out at Chamossiere 's 6000 foot summit. Eve is a confident beginning parallel skier, which put most of the terrain within our range of ability. The terrain varied from classic New England-style trails served by six person chairlifts to grand expanses above treeline accessible by winding poma lifts. We never seemed to be far from a small "creparie", housed in huts buried into the mountain with a few outdoor tables. Eve made a point of sampling most of their slope side offerings. Almost by accident, we found ourselves one day in the next village of Les Gets. While I enjoyed a proper lunch at a bistro just off the slope, Eve stuck with what she knew and liked best about French cuisine -- more crepes! After lunch, it became clear that Eve had had enough skiing for the day. I didn't want to endanger our good time by risking a meltdown on unfamiliar terrain. We deposited our skis at the bus stop and walked around town, checking out the local offerings, and, you guessed it, more crepes. The public bus ride back to Morzine was less than fifteen minutes. I was later informed by the proprietor of the inn where we stayed -- Le Dahu, a three star property a short walk from the town center -- that they routinely arrange to pick up guests at Les Gets and Avoriaz, the nearby gateway to Switzerland. La Plagne, a two hour drive from Morzine, offered an entirely different experience -- a purpose-built resort complex of apartment and hotel blocks high above treeline. La Plagne is within striking distance of the far better known resorts of Albertville, site of the last winter Olympics, Les Arcs, Val d'Isere, and Tignes, about a three hour drive from Geneva. 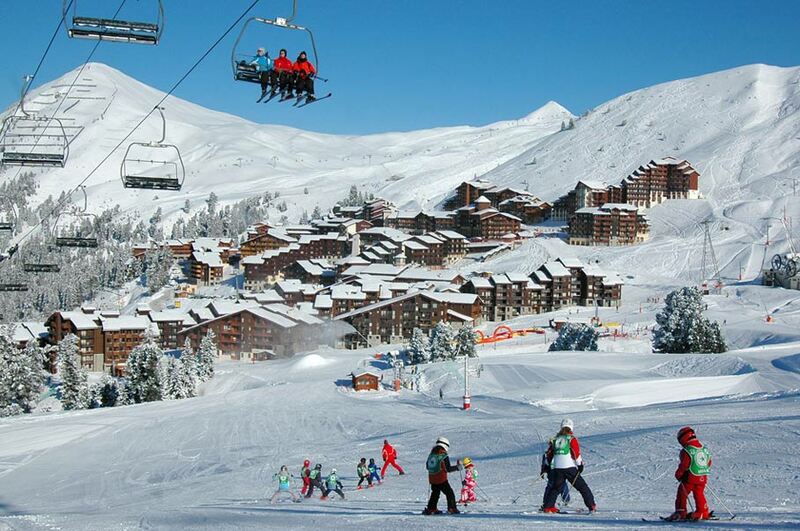 La Plagne is a complex of ten different resort areas winding their way up a single two lane mountain road. The highest of the resorts were built beginning in the 1960s as dedicated ski destinations. They offer lots of multi-story accommodations, including timeshares and rental apartments that cater to groups and ski packages, but none of the ambiance found in most French resorts. If you have come to ski, however, you need not regret the choice. The French, especially French families, come here to ski. Ski school classes full of young children are everywhere! Intermediate and beginning skiers in particular will marvel at the tremendous expanse of open, gentle terrain. More than half of the 120 slopes, served by more than 100 ski lifts, are geared towards intermediates. Many of these are reached after long, winding pomalift rides over spectacular treeless terrain. Better skiers will find 'off piste' skiing everywhere. The sheer magnitude of the skiing available, combined with my natural caution while skiing with children, made the task of deciding exactly where to ski quite an intimidating task. Skiing on our own, I hesitated to venture too far away from our base at Belle Plagne. After that first day, Eve and I benefitted tremendously from the companionship of a ski guide, who took the worry out of our ski decisions. ​I trusted Jacques to keep us within Eve's skiing ability and tolerance. And this he did expertly, while guiding us on a two day-long tour throughout the entire resort area -- from the Glacier de Bellecote, which is skied all year round, to Champagny en Vanoise, a small village on the backside of La Plagne, which offers the kind of alpine ambiance sought after by American travellers. "In an expanse so grand it is possible to find enough skiing for skiers at all levels"
We decided to spend a couple of days touring Geneva before flying back to Washington. Geneva is a wonderful city for exploring by foot. The focus of our visit was the promenade around Lake Geneva, punctuated by eateries, roller skating competitions, and a melange of well behaved international visitors. The promenade is the point where one can catch the various ferry and tour boats that ply the Lake. Since our visit was a short one, we didn't venture too far -- skipping the great castle, the Chateau de La Sarraz for example. We chose the hour-long 'Tour of 5 Parks' boat tour, which passes the trademark Jet d'eau -- Geneva's 430 foot high water jet -- and the Palais Wilson, the first home of the League of Nations. The view from the Lake is enough for many visitors, but it is possible to disembark at any time along the tour circuit to visit the grounds of these famous landmarks. Aside from the lakefront, we spent our time touring the alleys and hidden walkways of the Old City -- the original Geneva sited on a hill in site of the French frontier, and dominated by the twelfth century Cathedrale St.Pierre. The high point for Eve was the five cannons brought to the city by the conquering Napoleon ... and the crepe with hot chocolate that followed. La Plagne is easy to get to from any of four nearest airports - Chambery, Geneva Grenoble and Lyon - with airport transfers times between 1 hour 35 minutes and 2 hours 15 minutes in good conditions. La Plagne is also easily reached by rail to the Eurostar station at Bourg-St-Maurice, then 35km by bus or taxi to the resort. Taking the train to Avoriaz probably won’t be the quickest or the cheapest option, but it is certainly doable in a day. It will involve taking a morning Eurostar service to Paris Gare du Nord, and then taking a taxi across town to Gare de Lyon. From here take the direct TGV to Cluses, which is 40km away from Avoriaz.